Today's theme is "Free-Throw Shooting"
MSU coach Tom Izzo has already complained about the new hand-checking rules... too many fouls and free-throws, games taking too long to play, etc. Whether you agree with Coach Izzo or not, I'm betting that (especially the first few games of the season) to drive the point home, the refs are going to call a lot of fouls. Like Coach Izzo has said, it's not the fault of the officials... they are just enforcing the new rules. Free-throw shooting is going to be more important than ever. I hope that games don't become "free-throw shooting contests", but more free-throw attempts will likely be the reality. So if you can make more than the other guys, you'll have a better chance of winning. Getting to the line could be a big offensive weapon for teams that struggle to score from the floor. 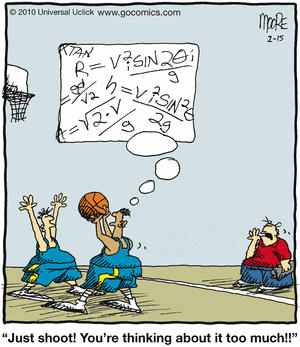 First, understand how important free-throw shooting is. At least 3 or 4 games per year in a 20 game schedule will be determined by free-throw shooting. All close games, the ones that really count.. the close tournament games and conference championship games can be won or lost on the free throw line. Team Goals in free throw shooting. Middle school teams should strive for 60% from the line, and high school teams - 70%. You won't shoot as well in a game as in practice, so strive for 75% (high school) in practice. This is a team skill... become a good free throw shooting team. Encourage and work with your players on free throws. How to become good free throw shooters... fundamentals, attitude and practice. In shooting free throws, develop a ritual where you do it the same exact way every time. Position yourself on the line the same way every time. Bounce the ball the same number of times every time, and take a deep breath before shooting every time. This creates muscle and mind memory, and allows you to be successful more often. Success creates confidence, and confidence creates better, more relaxed shooting. 1. Line up with your right toes just to the left of center so that your right arm and ball are lined up with the basket. Place the left foot back just a little. Shoulders should be square to the basket, or if you are more comfortable, you can turn the shooting side a little toward the basket. 2. Put your weight forward on your toes, but keep your back straight... don't lean forward. Keeping your back straight will keep you from stepping over the line. Bend a little at the knees. Your legs will provide the power with an "up motion". Alternatively, some players find it more natural if they first stand up with knees straight, but then initiate the shooting motion by dipping down and bending the knees, and then straightening them as they go up for the shot... a "down then up" motion. 3. Focus on the basket... don't look at the ball or the flight of the ball. 4. Shoot with your right hand (right-handed players), and just use the left hand to help balance the ball. Release the ball from your fingertips to get good backspin (rotation) on the ball. 5. Take the deep breath, and shoot. Use your legs for power and come up on your toes as you release the ball. If your back is straight, you won't cross the line or lunge forward. If you need more power (youth players), it's OK to jump a little on your release. 6. Follow-through. Keep looking at the basket and hold your shooting hand in the "gooseneck", follow-through position until the ball goes through the net. Attitude. Take a positive, aggressive attitude in shooting free throws... take the attitude that the opponent made a big mistake in fouling you, and you're gonna make 'em pay for it! Think positive! Think and say to yourself "net" or "swish" before each shot... to focus on the ball going through the net. Be confident... this comes from success, and hours of practice! Don't let a missed free throw ruin your confidence. If you miss one, just quickly analyze the miss and correct it. For example, if your shot was long, next one use less leg power, or use more arc. Too short, use more leg power. Off line, reposition yourself on the line, follow-through with index finger pointing at the target. Expect an occasional miss... no-one's perfect. Just don't let it bother you when it happens. The most important free throw is the next one, not the last one! Practice. Shoot free throws every practice, with the team, or on your own. Coming to practice 10 minutes early, or staying 10 minutes late, to shoot extra free throws will help. Practice team free-throws after a high-energy, competitive drill when players are tired. Easily customize your dry erase board using G-board's online customization tool. You can select school colors, upload your logo, and have your school/club name and the coach's name placed on the board. Would make a nice gift for your favorite coach! Order before Dec 16 to get it for Christmas. Or get the customizable "Sticker Board". You just peel off the backing and stick it on the wall, and you have an instant large dry erase board in your locker-room.